So what do I do when there is a property I like? I get the action figure. I honestly did not know that this action figure existed until I saw it on my friend’s Facebook page. And as soon as I saw it I had to have it. If you saw the last post, I really enjoy Mike Tyson Mysteries. A show that doesn’t take itself seriously in any which way and is funny as hell? I don’t know if I was really tired the other night but I just couldn’t stop laughing…so many things were so absurd. It makes the drunken, misogynistic Pigeon (voiced by Norm MacDonald) seem somewhat normal. 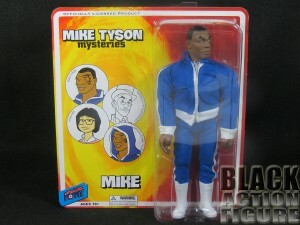 In any case, we have a new Mego-like action figure of Mike based on the show. That’s what I call merchandising! The packaging definitely gets props for making this feel like a 1970’s Mego experience. I personally had a Spider-Man and a Batman Mego, so I kind of remember the packaging, but at that age, I really don’t remember much. I’m pretty sure my Mom or Dad helped me rip the action figure off of the card to play with. Based on the “Mint on Card” shots I see on eBay? 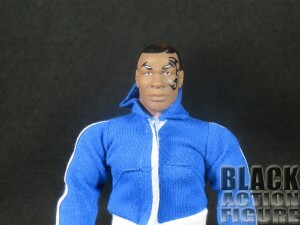 Yes, it’s accurate, but of course with it’s own Mike Tyson look and flair. So what do you get? You get Mike Tyson on a simple blister card. 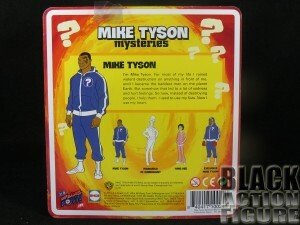 The card features pictures of three of the main characters plus a picture of Mike with the hood of his hoodie up. Which doesn’t make sense until you turn the package around. 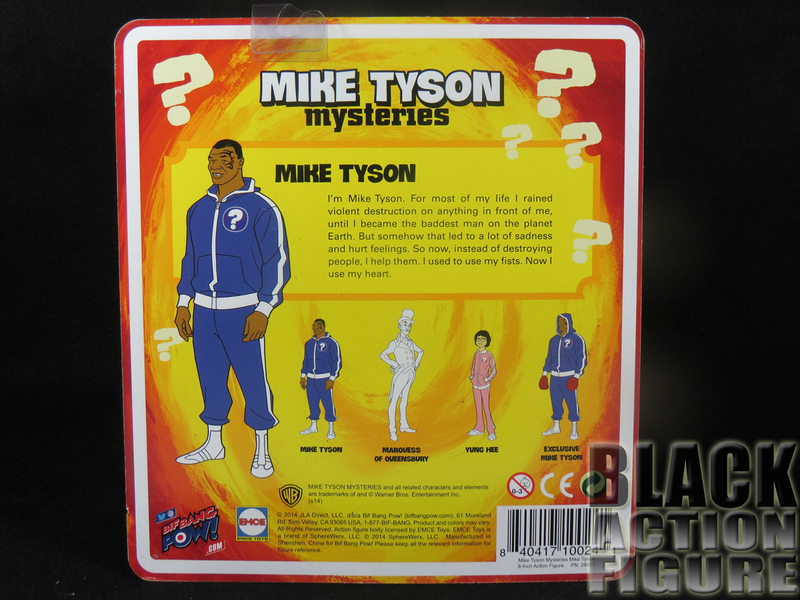 If you look at the same four characters on the bottom, you will see that the Mike with his hood also has boxing gloves on and says “Exclusive Mike Tyson”. Which after a quick internet search does exist. The other two (Marquess of Queensbury and Yung Hee) don’t seem to have been announced yet. I love Mike’s bio-blurb on the back. It stays in line with the tone of the show. “I used to use my fists. Now I use my heart.” Classic Mike Tyson. All in all, a nostalgic and fun style in packaging and I wouldn’t blame anyone for leaving this one on the card and displaying as is. Fortunately for you, I’m not that kind of person. Free your collectibles people. 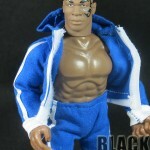 Outside of literally the clothes off his back, this action figure comes with no accessories. It would have been nice if it came with a Pigeon companion piece or even a regular pigeon carrying a note for help. Or anything. Like other Mego like figures, you can take the clothes off his back, but why would you? Three points for his clothes…the lack thereof is a disappointment. 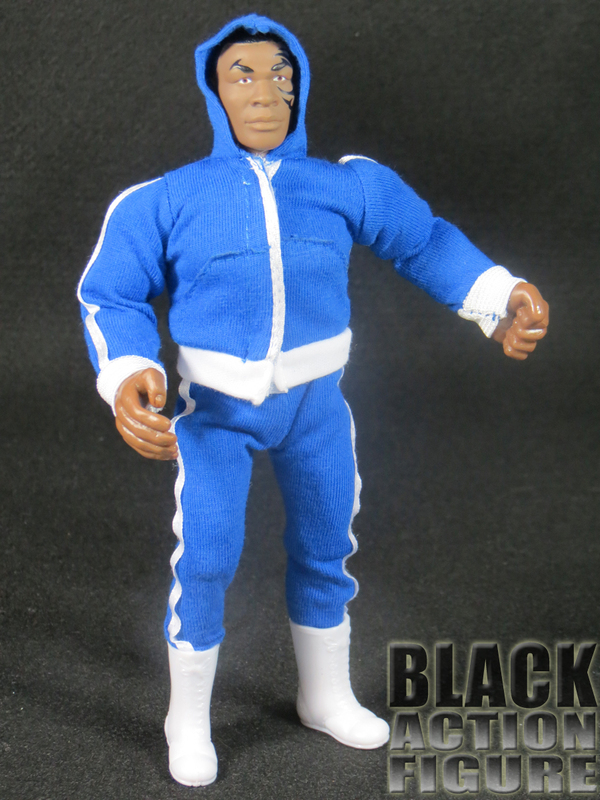 Like most Mego figures, Mike here is what I would like to call a “stylized” version of the character. He is technically correct in terms of look, but doesn’t quite have the same proportions as the character. 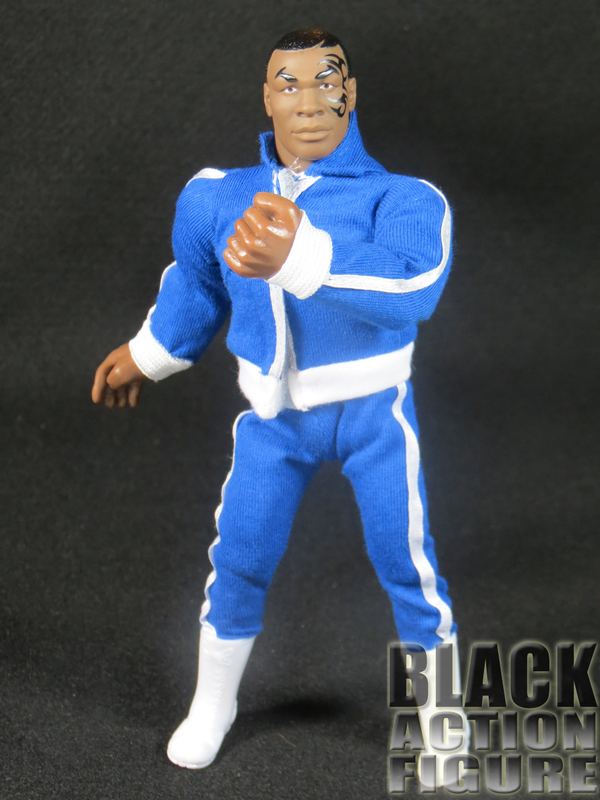 In this case Mike has the blue sweatsuit with the white boots. To note, there is no Question Mark emblazoned onto his hoodie, so major points taken away for that. For the curious, the figures hoodie is not a zip up, but a velcro enclosure. I wondered if he had an undershirt either under the sweatshirt or at least painted on. A quick two seconds answered that. I did not want the other question answered and so you will have to get your own to see what’s under the pants. In terms of sculpt and body, Mike has a pretty accurate head sculpt. It looks like Mike Tyson down to the scarily accurate face tattoo. Looking at the body under the hoodie, Mike looks like the Incredible Hulk, which I’m sure was true at some point in time. 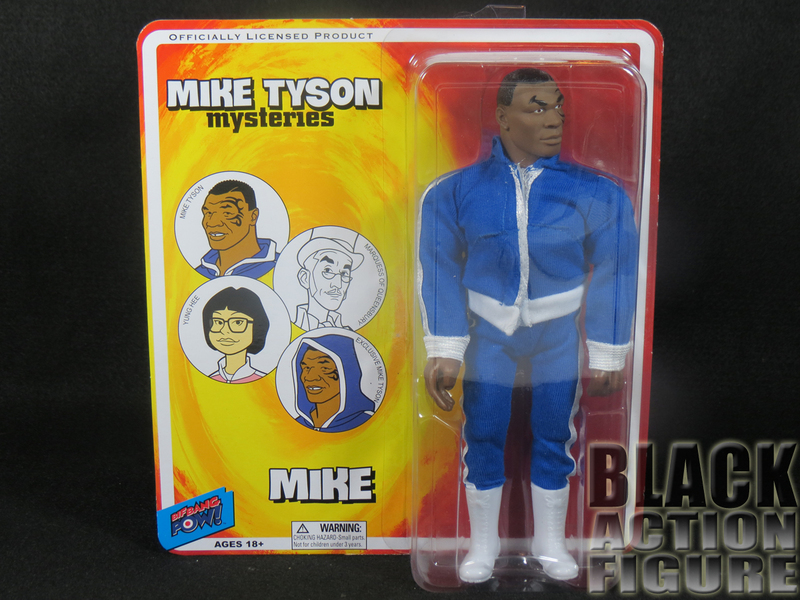 I should focus on using the cartoon Mike as a reference and not the actual Mike Tyson. Anyway, his legs seem very skinny in comparison to the rest of the body which gives that slightly disturbing Mego-stylized look I was talking about earlier. One thing that disturbed me slightly were the two different skin tones. 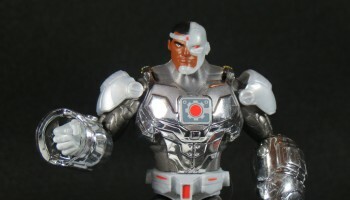 The figure’s head is a slightly different brown than its body, which can probably be attributed to the two different types of plastic. Kind of nitpicky, but noticeable all the same. Let me just say that I didn’t get this figure for it’s wonderful articulation. 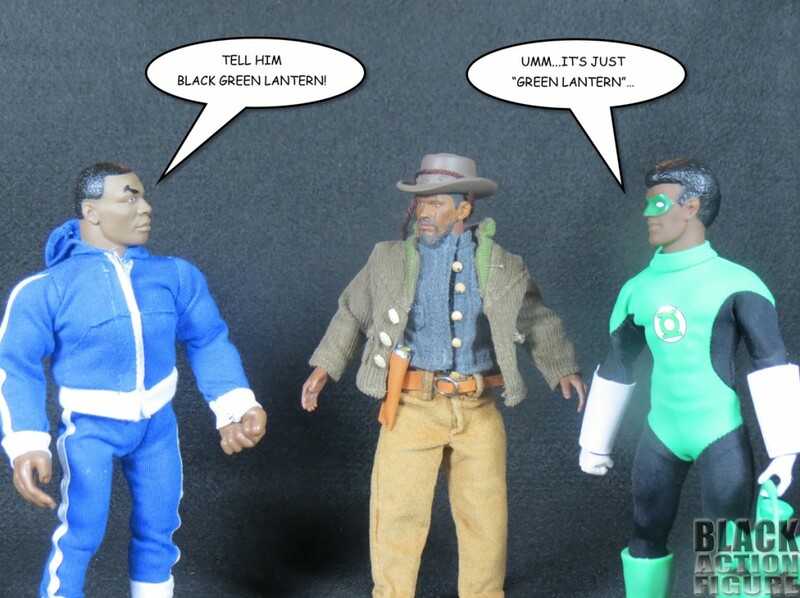 Which is good because when they said that this figure is “Mego”-like, they weren’t kidding. This action figure is put together with rubber bands like the mego figures were made back in the day. 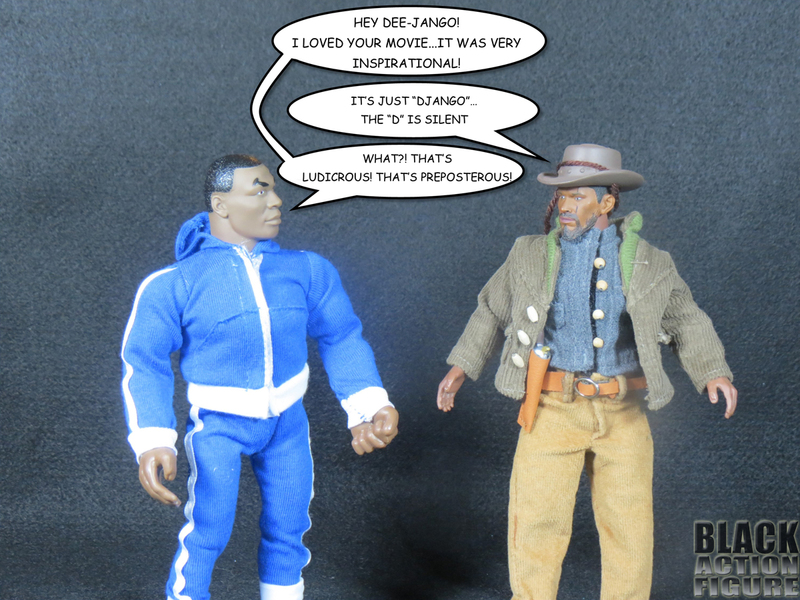 I honestly don’t think that was necessary and seems like toy company Bif Bang Pow could have at least modernized the figure with keeping with the Mego feel, like NECA has done with their line of “Mego”-like figures (See Django review here). With that being said, I think there is about 13 points of articulation that I’m comfortable in counting. I’m not putting this figure in any action poses because I don’t think it would make sense…unless it’s a pose of Mike knocking someone the %$&# out. Other than that, this figure can quietly just stand with the rest of the figures. As you see from my synopsis of the show here, I think the show is funny and a little bit of a genius how it comes off. I’m probably going to collect the toys either way. 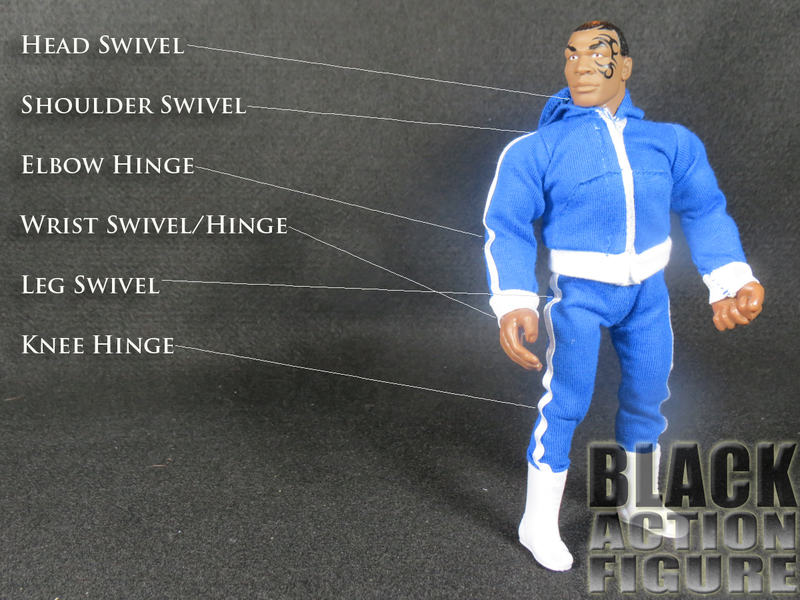 I just wish Bif Bang Pow would have put a little more quality and thought into the figure. Maybe a talking Pigeon figure is in the works. Who knows? But they do have some work on their hands. 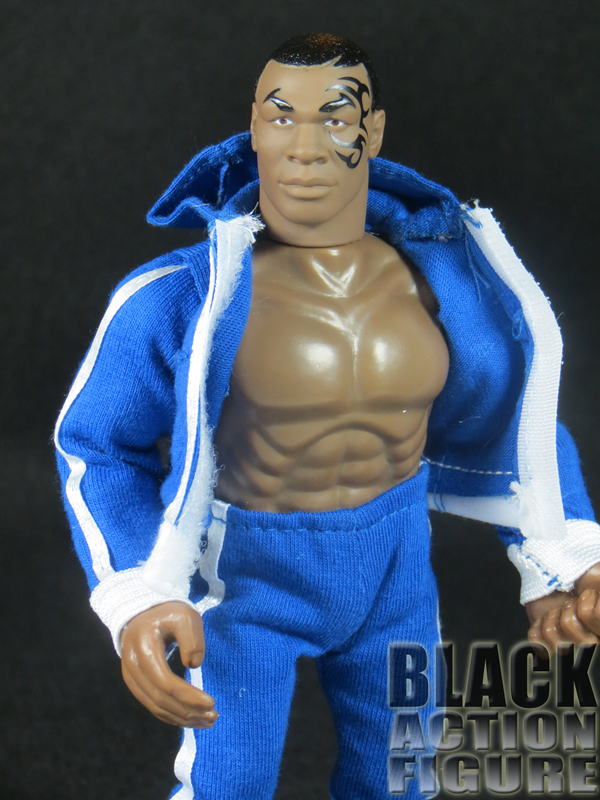 You know, since I’ve been collecting more and more 1/6th scale lately, a 12″ Mike Tyson would be boss. Get to it yall! 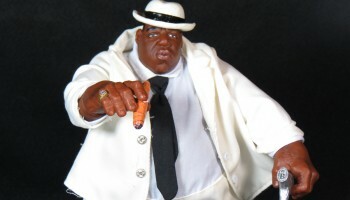 Throwback Thursday Review: Mezco Toyz 9″ The Notorious B.I.G.